A crucial push-and-pull will occur in the Senate this week that will determine citizenship for millions of immigrants. After months of behind-the-scenes haggling and committee work—and really, years and years of organizing, activism and elections—comprehensive immigration reform will have its moment on the big stage of the Senate floor this week. Monday evening, the Senate will hold a roll call vote on a five-year farm bill, and assuming there are no hitches, will then begin floor debate on immigration reform. It will take weeks, but Democrats want the debate wrapped up and a bill passed by the July 1 recess. As it stands now, the legislation (known officially as Senate bill 744, The Border Security, Economic Opportunity, and Immigration Modernization Act of 2013) creates a path to citizenship for most—but not all—of the 11.5 million undocumented immigrants in America. That’s a huge step forward, and Congress hasn’t seriously debated anything like it since 1986. Over the coming weeks, a fascinating push-and-pull will happen through the amendment process. Senate conservatives will propose measures that, if they pass, would amount to a “poison pill” that renders the entire legislation un-passable because Democrats wouldn’t be able to support it. Meanwhile, pro-reform activists and senators will be attempting to push the bill as far towards justice as is possible, with the aim of including the most possible people and removing as many roadblocks as possible. Senator John Cornyn’s border security amendment. Things will get interesting right away, as the Texas Senator and minority whip in the Senate will introduce a measure this week that basically tears out all the border security sections agreed upon by the “Gang of Eight” and the Senate Judiciary Committee, and replaces them with much tougher—and to most Democrats and reformers, unacceptable—requirements. QUESTION: How far are you willing to compromise on this bill to make it happen? In other words, what are you willing to give up and what is a deal-breaker? REID: Well, I will not accept any poison pills. I mean, we have a senator from Texas, Senator Cornyn, who wants to change border security, a trigger, saying that it has to be 100 percent border security, or there’ll be no bill. That’s a poison pill….we’re not going to have big changes in this legislation. The question now is obviously whether Cornyn can marshal enough votes—he would need all Republicans and some conservative Democrats—to pass the amendment. Just as important will be how Senate conservatives react if the amendment failed. Senator Marco Rubio hasn’t explicitly backed Cornyn’s amendment but has certainly suggested he favors it. If it fails, will Rubio declare the process dead and walk away? Rubio’s own border security measures. Despite Harry Reid’s declaration that no “major changes” to the bill will be made, Rubio has repeatedly insisted that the legislation must move to the right in order to pass. In particular, Rubio has said he will introduce a measure that makes Congress, not the executive branch, responsible for deeming that certain triggers have been met before citizenship can be granted. He also wants to further limit the government benefits that provisional immigrants can receive. Democrats oppose these measures but haven’t thrown down the gauntlet as they have with Cornyn. Some degree of compromise with Rubio will be likely, but how far? At what point do the Democrats say no? At what point would Rubio walk away? Agitation by far-right senators. There’s a group of far-right conservatives in the Senate who have made it pretty clear they oppose immigration reform outright. One of the leaders of this movement, Senator Jeff Sessions of Alabama, is proposing all kinds of extreme amendments, like 700 miles of double-layered fencing on the southern border and exit visa tracking at every point of entry in the United States, not just air and sea. The question isn’t really whether these will pass—they won’t—but how much Sessions is able to rile up the right-wing base when they fail. Until now the far right has been relatively quiet on immigration reform. There have been no rallies against reform, as there were in 2007, and evangelical churches are playing a key role in calling for real reform. Sessions’ floor speeches and media appearances are basically more important than his amendments. His goal isn’t really to change the bill—he can’t—but to wake up and shake up the base. His op-ed in the Los Angeles Times on Monday is a good demonstration of this effort. “Should it pass, [this legislation] would represent the ultimate triumph of the Washington elite over the everyday citizen to whom Congress properly owes its loyalty,” he wrote. Who is eligible? Senators are going to keep trying to both trim and expand the number of people eligible for citizenship. The headline will be Senator Patrick Leahy’s effort to include LGBT immigrants in reform, so that all partners are eligible for benefits and citizenship that until now is limited to straight immigrants and their families. Leahy was unable to marshal many of his fellow Democrats on the committee to support it, let alone any Republicans—who again, are having their rear covered at this point by evangelical churches—and the amendment is likely to fail on the Senate floor. But some senators are trying to pull it in the other direction. 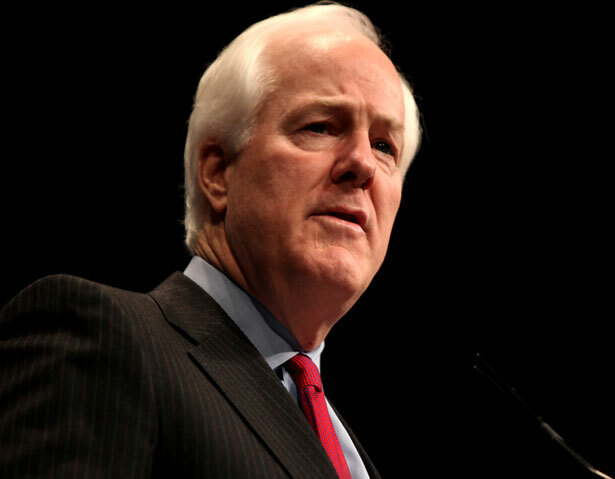 There is Cornyn’s aforementioned effort to expand the list of criminal offenses that ultimately lead to denial of citizenship. Senator Joe Manchin, a conservative Democrat, is set to introduce an amendment that would force the children of undocumented immigrants to get a college degree or join the military before receiving citizenship.